At DreyerCoaching.com, we do not give our students long lists of vocabulary words and grammar points to memorize; there are more than enough "cram schools" doing that already. Instead, we want to teach "real English," the way English speakers, especially Americans, actually communicate in real life. And a big part of that is helping our students understand idioms (sayings). Idioms are non-literal sayings that communicate a point or truth. By "non-literal" I mean, the words have a symbolic, rather than a "black-and-white," meaning. And this is what makes idioms so hard to understand, especially for learners of a new language, but also so interesting. Here is an example. A common English idiom is "It's raining cats and dogs." Obviously, this does NOT mean cats and dogs are literally falling from the sky during a storm. Instead, it has a symbolic meaning: that the rain is very heavy and severe. To my knowlege, all languages have idioms, and learning them is one of the most fun and rewarding parts of learning a foreign language. I like it because different languages have their own unique ways to express a truth or insight, that one's native language might not have. For example, today I was teaching a student the idiom "to peter out," which means "to gradually weaken and end." I told him Chinese has a saying with a similar meaning: (虎头蛇尾) "Tiger Head Snake Tail." I love that imagery and metaphor! A tiger's head is ferocious and powerful, while a snake's tail gradually reduces to nothing. It's a powerful word-picture of a person or plan that starts with much noise and attention, but eventually peters out to nothing. Why are idioms important to learn? And not only is learning idioms fun, it is also important. Spend much time reading or listening to English, and you will encounter them. Just today I was listening to a podcast and heard one of the speakers say she was "worked up," and I thought to myself: idiom! If you only focus on the literal meaning--like cats and dogs falling during a rain storm--they will not make sense. But when you learn the idioms, you will understand what they mean when you see or hear them, and you can start using them in your English speech and writing too! Since idioms are so fun and so important, that is why I make them a priority and have been starting my online classes with an idiom lesson ever since I began teaching ESL online in 2008! I began with idioms starting with "A" and have been going through the alphabet ever since. One of my most loyal students, Ricky in Taiwan, looked back through his old notebooks and discovered that he joined my online class when I was back in the B's, teaching "by hook or by crook." Ricky has stayed with me for years, and now we are up in the O's. Today he learned "Old Wives' Tales." Where do idioms come from? Since English is a global language with a long, rich history, it takes idioms from many different sources and time periods. Some idioms are thousands of years old (The Midas Touch) while others are recent (be on the same page), which has only been traced back to 1974. The Bible: This ancient book has had an enormous impact on the English language and Western thinking. There are many examples of Bible verses and names that have become English sayings: (As old as the hills; Good Samaritan; David and Goliath; The blind leading the blind; Let he who is without sin cast the first stone). Ancient Greece and Rome: English takes many words from Greek and Latin, and we take many sayings from these ancient civilizations too: (Achilles' Heel; Trojan Horse; Rome wasn't built in a day; All Roads lead to Rome). Farming: Up until the past 100 years or so, most English speakers around the world lived by farming, so many of our sayings come from that agricultural history. (Don't count your chickens before they hatch; Don't look a gift horse in the mouth; Hit the Hay). Native American Indians: Although a small percentage of the US population today, American Indians have had an enormous impact on American culture and the English language that lives on today. (Bury the hatchet; Keep your ear to the ground; Low man on the totem pole). Rhymes: Some sayings become popular because they rhyme and are thus easy to remember. (Plain Jane; True Blue; Snug as a bug in a rug). Alliteration: Many other idioms repeat the same vowel or consonant sounds, and are thus fun to say. (Chatty Cathy; Get your Goat; Footloose and Fancy-free). Names: A few people have actually had their name become part of the English language: (the Real McCoy; Fighting like the Hatfields and McCoys). To help our students improve their English skills, I am starting this list of English idioms, in alphabetical order. Watch Scott teach the idiom "Roughing it" in this video. Please come by often to see the new additions! This blog post is UNDER CONSTRUCTION. Visit often to see what we have added new. Origin: "to hit" can mean to make a successful connection, as in "he hit the ball," so a big hit is a big success. 2. The oldest movies were all black and white, but the 1939 color films The Wizard of Oz and Gone with the Wind were such big hits, most movies since have been in full color. 1. Abraham Lincoln, running for US Senate in 1858 (two years before the start of the Civil War), quoted the Bible in his now-famous "House Divided" speech": "'A house divided against itself cannot stand.' I believe this government cannot endure, permanently half slave and half free." 2. 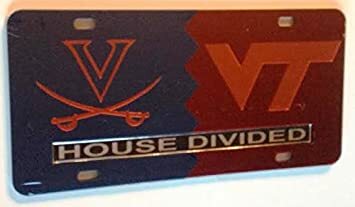 With one daughter going to the University of Virginia and another attending rival Virginia Tech, Bryan laughed and put a "House Divided" licence plate on his car. 1. When Debby noticed that Greg appeared lost in thought, she asked him, "A Penny for your Thoughts." 2. Frances noticed that Mike was smiling silently. "A Penny for your Thoughts" she asked him, to bring him back from his daydreams. Origin: Long ago, clothes did not have pockets so people kept things in their sleeves. Magicians often hide objects in their sleeves. This idiom comes from card games like poker. A person who is cheating might have an ace hidden in the sleeve of his shirt. The other players do not know it is there, and the cheater will bring it out at the right time to win the game. 1. Some people do not understand why Billy gets the best jobs in our office, but Billy has an ace up his sleeve: he is married to the boss' daughter! 2. If you want to improve your English skills, you can have a GREAT ace up your sleeve--join an online English class with DreyerCoaching.com! Learn real American English right at your home or office! Find out more here! Origin: A shadow is dark but harmless. It cannot hurt anyone. So, to be afraid of your own shadow means to have no bravery. 1. Our dog is a terrible watchdog. She is such a coward, she is afraid of her own shadow. 2. Teddy would never want to hurt anyone. In fact, he is afraid of his own shadow. Origin: When a teacher and student are "on the same page," they know what is going on in the classroom. When you are on the right wavelength, FM, AM, or TV, you can pick up the correct station. 1. "Since our Science Fair project is due next week, we need to meet after school today to make sure we're all on the same page about who's doing what," Megan told her group-mates. 2. Before a man and woman agree to get married, they need to be sure they're both on the same page about important issues that will eventually come up in their marriage, like doing household chores, managing money, raising children, etc. Good premarital counseling can help a couple talk through those issues before they become problems later. 3. Billy and his brother are never on the same page; they argue all the time and eventually had to move away from each other. Origin: In old factory days, workers stood on a hard floor and the only carpet was in the boss' office. And often, workers were called to the office just to be scolded or corrected, so to be "called on the carpet" means you're in trouble. 1. Chuck got called on the carpet when we was late to work three days in a row. 2. No one likes to get called on the carpet, so a wise teacher (or parent or boss) knows that correction should normally be done in private, whenever possible, without others watching. Origin: A source is where something comes from, so when someone says or writes something, we should judge if the speaker is honest or not. 1. Billy says his dog ate his homework today, but consider the source: Billy has said that three times this week. His dog must love paper! 2. Ellen says that new restaurant has terrible food, but consider the source; Ellen is such a critical person, nothing is ever good enough for her. no one can compare with you. You have done many wonderful things. You have planned to do these things for us. 1. "Mom, I hate school," Mandy said. "Some of the teachers are mean and there's too much homework." Mom replied: "Count your blessings: think of all the children in the world who can't go to school, and will probably never make anything out of their lives!" 2. "Count your blessings" is such a popular saying, it even inspired the popular hymn written in 1897 (read its story here) and its 2017 remix (story here). Meaning: do not be so weak and accepting, that other people feel like they can treat you badly or meanly. Origin: If someone feels like they can be mean to you or take advantage of you, we say "You let that person walk all over you." 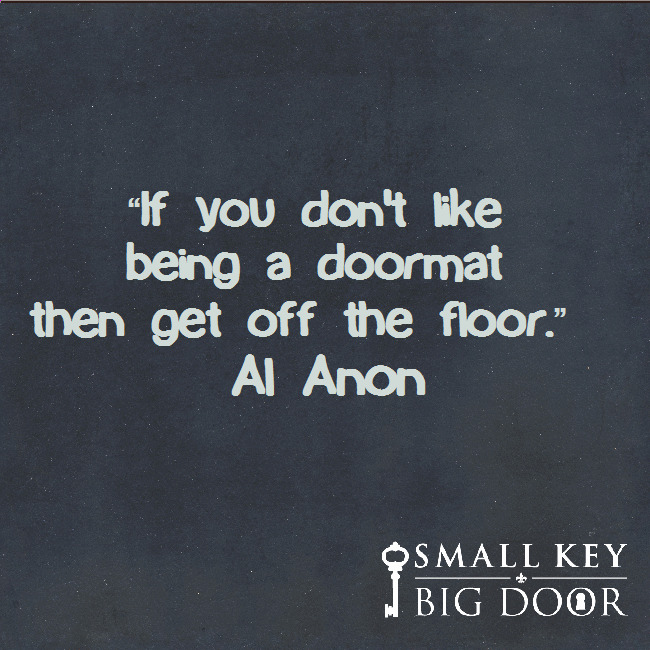 And since a doormat is on the floor and people walk on it, we say, "Don't be a doormat." 1. Richard is so weak and spineless, he lets everyone at work walk all over him but he still does most of the work. He's got to stop being such a doormat. 2. It is important for a husband and wife to compromise and cooperate to make the marriage successful, but that does not mean that one member of the marriage treats the other like a doormat. Respect has to go both ways. 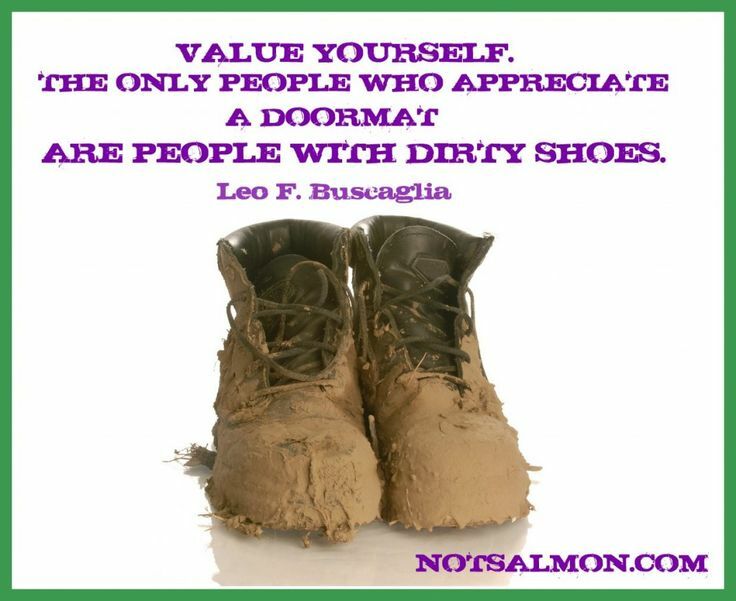 Here are some good quotations about NOT "being a doormat." For lots of uses of the word "get," check out our blog post. 1.Uncle Billy is almost 90, but when we saw him at Christmas, he was in the pink--in great health and with a super attitude! 2. Tom and Freeda have been in the pink since they retired and moved to Florida--they love the warm winters, sunshine, and beaches! 1. No one wanted to live near the huge Wal-mart parking lot, because it was lit up lit up like a Christmas tree every night of the year. 2. Felicia lit up like a Christmas tree when she got the acceptance letter from her dream college! Origin: In some cultures, nine is a lucky number, so Cloud Nine is very high. To be on top of the world is to be at the highest spot possible. 1. Hugo felt on Cloud Nine when his crush told him she liked him. 2. Billy was on Cloud Nine when he was the only student in school that day; everyone called in sick except for him, so the teachers treated him like a king. Origin: People's addresses are on a street, so if you live on Easy Street, you are in a great place! 1. Ben felt like he was on Easy Street after he got a promotion and a big raise. 2. With her new job, apartment, and boyfriend, Carla thought she was living on Easy Street...until her car broke down, leaving her with a $1,000 repair job. Meaning: This refers to the uncomfortable, nerve-wracking time time spent waiting for important news to arrive or something big to happen. Origin: Pins and needles have sharp points, so obviously sitting or standing on pins and needles would hurt and you would want to stop the pain! 1. Dave had a job interview on Monday, and he's on pins and needles waiting to hear back if he got the position or not. 2. Billy was on pins and needles, waiting until the last second until the Nintendo Switch was released. Meaning: to be organized, knowledgeable, in control, and "on top of things"
Origin: in soccer and most sports, when the player is "on the ball," he or she is controlling the ball and doing well at the game. 1. Sandra was always on the ball, so we voted for her to be in charge of the class dance. 2. Joshua is always on the ball when it comes to management, so we chose him to be the secretary of the Huguenots Club. Origin: The electric chair is a means of execution, so it is the actual "hot seat." 1. Frank was on the hot seat when he showed up to class without having done his part of the group project. 2. Billy was on the hot seat after his brother found out that it was Billy who stole his pizza. 3. Joshua was in the hot seat after he poked someone's eye with a paper airplane. 1. Greg and Maggie wanted to paint the town red the night when they learned he had gotten his promotion. 2. Richard's plan to paint the town red was cut short when he realized he had left his wallet and keys at home and had locked himself out. Origin: The Ritz Hotel in London is a well-known symbol of wealth and high-living. Songwriter Irving Berlin wrote the song "Puttin' on the Ritz" in 1927, (during the Roaring 20's), and a movie by this name featured dancer Fred Astair. Hear the song and see Astair in this video. 1. If you attend the big gala Saturday night, you'll see lots of the wealthiest people in our city putting on the ritz. 2. Everybody in our company is asked to put on the ritz in order to show how powerful the company is, since other famous corporations like Tencent will also take part in the conference this year. Origin: In the American "Wild West" of the 1800's, there was little or no legal system. The nearest judge and court might be 500 miles away. Many people had to rely on their gun skills to defend themselves or uphold justice. So, "to be quick on the draw" meant to be able to pull a gun out quickly and use it correctly in case of sudden danger or challenge. 1. It's hard to play a joke on Uncle Bob; he's so quick on the draw, he can usually see it coming and think of a quick comeback. 2. Our math teacher is quick on the draw. Whenever we make a calculation mistake, she can almost always identify it right away. Origin: Mice are small, quiet animals that secretly go about looking for food or hiding places. With cat, dogs, and owls about, a noisy mouse will quickly be a dead mouse! This is one of MANY animal similes in English, such as: sly as a fox, stubborn as a mule, wise as an owl, poor as a church mouse, etc. 1. Quiet as a mouse, Maggie tried to slip back into her house after curfew, but her mom caught her. 2. Quiet as a mouse, Billy tried to sneak into the lecture hall at the back so the professor would not see that he was late again. Meaning: Rest and Relaxation; to take a break from work and have some fun. Origin: The US and UK military forces allow set times for "Rest and Relaxation" when soldiers are allowed to leave their place of duty and go on a short vacation somewhere. 1. During the Korean War, many US servicemen went to Japan for R and R because Japan was close, at peace, and more developed than Korea. 2. "I've been working really hard so we're going to the beach for some much-needed R and R," Dad told his family. Meaning: a ticket that shows you can get into an event later, or get an item at a sale price if it is SOLD OUT now. Origin: in the 1880's, baseball games gave rain checks to fans in case the game was rained out, so the fans could attend another game later. 1.Mom had a coupon for 50 cents off toothpaste, but when she got to the store, that item was sold out; so, she asked the store manager "May I have a rain check?" 2. Arianna has been looking for a T Rex costume for weeks, so when the supermarket finally had a discount on it, she rushed to the counter but found out they were all sold out. So she smiled splendidly and asked: "Can I have a rain check please?" - Lucy in Beijing. 1. "It's raining cats and dogs out there," Ricky said as he came in, soaking wet. 2. "It's raining cats and dogs -- I just stepped in a poodle" is an old, corny joke, because "poodle" looks and sounds a bit like "puddle." 1. The church picnic will be at 12:00 on Saturday, rain or shine. 1. Meredith raised a few eyebrows when she showed up at school with her hair dyed bright green. 2. The principal raised a few eyebrows when she said all the teachers had to stay after school to provide extra tutoring, but that they wouldn't get paid any extra for it. Origin: This is another idiom from the Bible. According to the book of Genesis, the first people were Adam and Eve, and their first two sons were Cain and Abel. Cain got mad and killed his brother, so Cain was a big trouble-maker. 1. I'm going to raise Cain if our boss wants us to work again this weekend-- I'm getting tired of it! 2. We used to spend a lot of time driving around and raising Cain when we were teenagers, then we all got married and settled down. Origin: the first person known to say "rally 'round the flag" was General (and later President) Andrew Jackson at the Battle of New Orleans in 1815 (which ironically was the biggest battle in the War of 1812--and fought several weeks after the war had officially ended!). Jackson is on the $20 bill today. (source) A famous US Civil War song "The Battle Cry of Freedom" repeats this idiom over and over. It inspired the North to keep fighting defeat the South, preserve the Union, and end slavery. The part "down with the traitor" means "defeat the South" and the part "up with the star" means "keep the US flag up high." 1. Aunt Sally has been very sick this year, so we'll try to rally the troops to get the whole family to get together to see her this Christmas. 2. The surprise little 1982 Falklands War began when the leader of Argentina tried to use the "Rally 'Round the Flag" effect to stir up support at home by attacking the Falkland Islands, which he claimed as Argentinian. However, British Prime Minister Margaret Thatcher fought back and rewon the tiny islands. The "Rally 'Round the Flag" phenomenon worked for her, because she stayed in office until 1990! Watch the video to learn more. (Language note: Chinese has only 1 word for "rat" and "mouse," (鼠 Shǔ) but in English, these two animals are different. Rats are big, ugly, and scary, while mice are smaller and some think they look cute. That is why Walt Disney created the famous cartoon character "Mickey Mouse" but NOT "Ronald Rat." Meaning: This represents the busy, competitive life that many workers have on a daily basis: wake up early, rush to work, work hard, try to make lots of money, get ahead of your co-workers and the competition, go home late, fall asleep exhausted, and wake up the next day and repeat! Origin: From rats in a laboratory experiment, racing through a maze to be the first to get the cheese. 1. After twenty years of the rat race as a well-paid New York City lawyer, Bill quit his practice and moved to Virginia to be an organic farmer. 2. Some say, "Even if you win the rat race, you're still a rat." So, there is more to life than making money and beating the competition. It is important to be a nice person. 1. The school principal was more and more unpopular and unreasonable, so tons of teachers were leaving like rats abandoning a sinking ship. 2. We thought the new boss would improve our company, but it turns out he's a real jerk, so people are leaving like rats abandoning a sinking ship. I'm looking for a new job too. Meaning: To use your mind and context clues to infer a meaning or message that is not stated plainly in obvious language; to figure something out by putting clues together. Today this idiom can refer to something written, spoken, or just in life. Origin: Some old secret messages included invisible ink or hidden messages written between the lines of a normal-looking letter. 1. Molly didn't say she can't come home for Christmas, but she said she will be busy this winter, so reading between the lines I don't think we'll see her. 2. Margaret says she still likes Ben, but she's spending a lot of time with other guys lately--reading between the lines, I think they'll break up soon. 1. Mom read Billy the riot act when he brought home a report card full of D's and F's. 2. The judge read Carly the riot act when she had been caught speeding three times in three months; after a good scolding, he assigned her to a Driver Improvement Program (DIP) class and suspended her license for a month. 1. The designer bag Emily bought in New York isn't a cheap fake, it's the real deal. 2. In our shallow world, it's hard to find loyal friends, or more importantly, a loyal husband or wife. When you find someone who's the real deal, treasure that person! 1. For years we had an artificial Christmas tree, but in recent years we've bought a live tree; a natural tree is the real McCoy, and it looks and smells so nice. 2. If you buy luxury items from a street vendor, it's easy to be tricked--fakes are always a lot cheaper than the real McCoy. Origin: The famous ship Titanic sank in 1912, killing 1,503 people, including some of the world's richest. Obviously, as the Titanic was sinking, rearranging the chairs on the deck would help no one and actually be a waste of time. 1. Many of the teachers were deeply concerned that many of their students could barely read or write, so when the school system told them to spend more time on record-keeping and testing, instead of actual instruction, they felt like they were rearranging the deck chairs on the Titanic. 2. How often in life do we ignore crucial issues and instead get sidetracked by trivia, simply rearranging the deck chairs on the Titanic instead of focusing on what is truly important? Meaning: to give a grand, showy welcome to a guest. Origin: When a president or king visits a country, the hosting president often has a long, red carpet rolled out to show how much they respect and welcome their new guest. From this we also get the idiom, "Roll out the red carpet." 1. 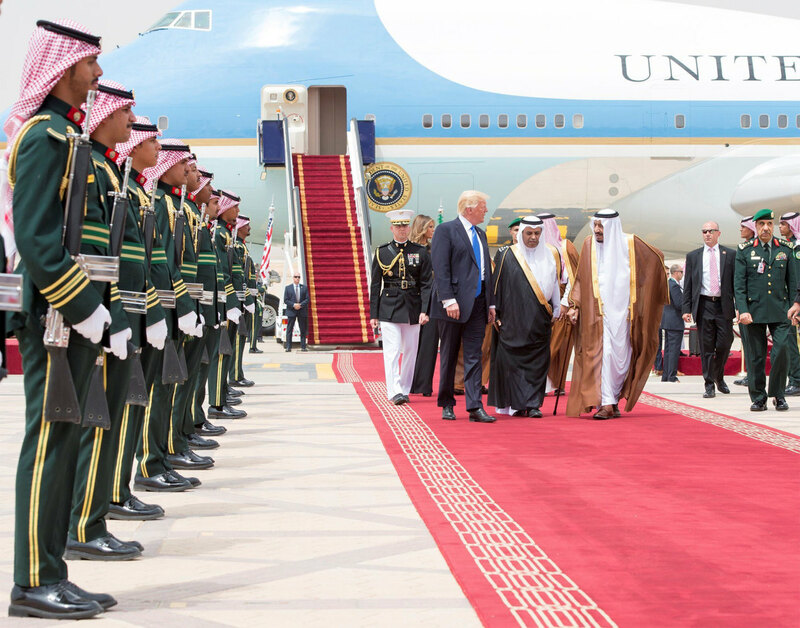 The King of Saudi Arabia gave President Trump the red carpet treatment when Trump visited the Middle East in 2017. 2. Several years ago I taught a student in Beijing who attended a school near Tienanmen Square. Once when the King of Jordan visited China, he and his classmates were brought out to wave Chinese and Jordanian flags and participate in the red carpet treatment as the President of China welcomed the king. 1. Good authors of mysteries fill their novels with red herring so the readers follow lots of rabbit trails and dead ends. 2. Magicians like to wave one hand to catch everyone's attention so they can do the real trick with the other hand. Someone said politicians and the media do that too: they use red herring so people focus on trivia or side issues instead of the really important matters. 1. USDEBTCLOCK.org shows the skyrocketing red ink for the US government, household debts, student debt, etc. The US government budget has been in the red for a long time. What a disgrace! 2. When I was in Taiwan and watched the stock reports on the TV news, I was surprised to see red ink showed stocks that went UP that day, and green showed stocks that went DOWN. In the US, it is the opposite! Origin: As long as 2,000 years ago in ancient Rome, special days and holidays were printed in red on calendars. Even today, many calendars use red ink to denote a holiday. 1. May 8, 1945 was a red-letter day across most of the world when Nazi Germany surrendered, thus ending World War II in Europe. That date is called VE Day today, for Victory in Europe. 2. Reaching your 18th or 21st birthday is a red-letter day for most people--adulthood! Origin: Most believe this saying started with the King of Spain in the 1500s, who began using red tape or ribbon to mark and hold together important documents. 1. When I taught in Taiwan, we had lots of red tape to deal with at the end of each school year-- the teachers got a sheet that required multiple people to sign off that the teacher had turned in grades, cleaned the classroom, etc. Meaning: to "reinvent the wheel" means, go to a lot of work to make something that has been created before; to waste time and effort. Therefore, "Don't reinvent the wheel" means "save work and energy; use what has been made before, instead of working hard to duplicate what someone else has already done." This relates to: "work smarter, not harder." Origin: The wheel is one of mankind's oldest and most useful inventions, so now that we have it, there is no need to invent it again. 1. At DreyerCoaching.com, we give each student a feedback sheet every nine weeks to show them their progress, and since we don't want to reinvent the wheel, we use the same basic form each quarter. 2. Mr. Crawford introduced his history project this way to his students: "Class, if you just follow these five simple steps, and give us the information I am asking for, you will get an A on this project. There is no need to reinvent the wheel." Origin: In the Wild West days of stagecoaches, the driver held the horses' reins while someone sat next to him holding a shotgun. Travel over long distances in the Wild West was dangerous, with possible attacks from native Americans, bandits, or wild animals, so travelers usually were armed. 1. "I call shotgun," Benny called as the kids rushed toward the car. 2. When our kids were young and we took long road trips in our van, I usually drove, my wife rode shotgun, and the kids sat in the middle or back. Great memories! Origin: This is one of MANY idioms from the Bible. This is from Matthew 6:3-4. Ironically, this saying has a negative connotation today, but Jesus said it with a positive connotation. When you do some good deed, do it privately so that God, and not other people, will praise you. 1. This school is driving me crazy: the department chairman tells us to raise our academic standards, but the principal says "no students can fail here." We teachers can't do both of those same things! The right hand doesn't know what the left hand is doing! 2. I just left a meeting where the marketing director said we have to start shipping our new product in three weeks, but the secretary heard from the packaging director that shipping starts tomorrow! No wonder everyone here has a headache: the right hand doesn't know what the left hand is doing! Origin: It probably comes from baseball; once a ball comes off the bat, the player has to start running toward first base right away. 1. The other teachers had warned the substitute teacher that Billy was a troublemaker, so when he started acting up in class, she sent him to the principal's office right off the bat. 2. We were happy to hear that Larry applied for a new job and got hired right off the bat! He starts Monday. 4. During my trip in Japan, all the adults went shopping right off the bat when they heard there was a 40% discount, while we children chose to sleep in the hotel yawning all the time. Meaning: Both mean "right away, from the very beginning," but with a small difference of usage (see below). Origin: "Right out of the box" comes from computers or software. You just open the box and can start using the item. So, you usually use this idiom to refer to a product, item or food you can start using right away. 1. It's amazing how technology has grown so quickly. You can buy a computer and start using it right out of the box. 2. "Honey, this lasagna is delicious." "Thanks, Ben, but it's right out of the box. I just put it in the microwave and it was ready in 20 minutes!" 3. The Eagles started the basketball game strong right out of the gate. They scores 8 points in the first two minutes. 4. The meeting got off to a bad start right out of the gate, when the boss told the new employee to put her phone away and she got a bad attitude. 1. Billy was walking Claire to her locker and right then and there he asked her for a date. 2. Glen strolled into PE class five minutes late and the teacher told him to do 25 push-ups right then and there. 1. I met a guy this weekend named Doug; he says he went to elementary school with you. Does that ring a bell? 2. Pearl said someone named Hank used to work with me, but that doesn't ring a bell at all. 1. "Rise and shine" mom called at 6:30 on the first day of school. 2. "I'd better be getting to bed, so I can rise and shine bright and early in the morning--I have a big meeting at 8:00 tomorrow," Larry said. Meaning: "Rock the boat" means to upset people or the status quo (current situation). So, "don't rock the boat" means "do not upset people by bringing changes; keep things the way they are." Origin: People should sit still in a small boat so the boat stays stable. If people move around in a boat they might rock the boat; that can make everyone feel uncomfortable, and the boat might even sink. 1. Mary comes late to most of our gatherings. Sometimes I'd like to speak with her about it, but I don't want to make her mad because she might stop coming completely. I don't want to rock the boat, so I guess I'll keep my mouth shut. 2. We have a bipolar boss: he's happy one moment and furious the next. I've thought about confronting him but all my friends warn me, "Don't rock the boat," so the problem continues. "Don't Rock the Boat" was a big hit from 1974; take a listen. Meaning: to take a big risk or chance, with possible outcomes of a huge success or terrible failure. 1. Billy felt nervous asking the prettiest girl in class if she'd go to the school dance with him, but he decided to roll the dice and ask her anyway. 2. Ben didn't think he had much of a chance of getting the new job, but he chose to roll the dice and apply anyway. To his pleasant surprise, he got called in for an interview! 1. Each spring, we at DreyerCoaching are DELIGHTED to roll out our new classes for the upcoming school year. Click here to find out more about how our classes work. 2. It's hard for most people during the hot summer to think about Christmas, but savvy business leaders are already planning how to roll out merchandise for the lucrative Christmas shopping season. 1. Life has its unexpected twists and turns, so you have to learn to roll with the punches and keep going. 2. One of the most valuable skills in life is to know how to stay flexible and roll with the punches when things don't go your way. What does this cartoon mean? English is a crazy language! What does this picture mean? Meaning: it takes a lot of time and effort to make something great and valuable; be patient and keep waiting for and working for success. Origin: The City of Rome, the capital of the great Roman Empire, was the leader of much of the world for hundreds of years. It has many beautiful buildings and roads that took lots of time, money, and work to build. 1. It is easy for students to get tired and discouraged, as they face all the homework, tests, and grades. However, it is important to remember: Rome wasn't build in a day! Be encouraged and keep on going! 2. Learning a foreign language is a long-term process, but Rome wasn't built in a day! And DreyerCoaching.com can help you! 1. Being positive and optimistic is an important part of a happy life; however, if you go too far, you might look at the world through rose-colored glasses and miss dangers or warning signs. 2. Molly thinks everybody is a good person. Since she looks at everything through rose-colored glasses, I'm afraid she will get really hurt some day. 1. We used to be able to go anywhere in school during noon break until a couple of kids went to the bathroom and got in a water fight, so now we all have to stay in our classroom during break time. It's not fair, but our teacher told us, "one rotten apple spoils the barrel." 2. Most people are honest with their medications, but a few take too many and get addicted, so now the laws are stricter and it's harder for everyone to get pain killers. Marie is mad about that, because it's harder for her now to get the medications she needs for pain managment. One rotten apple spoils the barrel. 1. Lots of people enjoy camping because they like the change of pace of roughing it for a day or two. 2. After the huge 2012 windstorm knocked out power for milions for days or even weeks, I think my parents actually enjoyed roughing it for about a week without electricity or running water. Dad carried water up from the lake and boilied it on his gas grill and shaved outside on his deck--they cooked canned food the same way. Pretty amazing, especially considering mom and dad were in their 80's! Historical Note: Roughing It was also a famous book by American author Mark Twain. Watch Scott teach this idiom to his advanced students here. Meaning: a person feels like they never completely belong or fit in; feeling like an outsider or you don't belong or "fit in" with any group; being a "misfit." Origin: a common children's game lets kids put pegs in the right holes. However, a square peg will never quite fit in a round hole, or vice versa. 2. The term "third-culture kids" refers to children whose parents are from one culture, but they grow up in a second culture, and become a blend of the two. An advantage for these young people is they can get along with many different kinds of people, yet a disadvantage is they can feel like a square peg in a round hole, never really fitting in anywhere. 3. The 1964 hit Christmas movie Rudolph the Red-Nosed Reindeer shows an island of misfit toys. Those toys surely felt like a square peg in a round hole. What is the message of this cartoon? 1. Some parents encourage their children to get part-time jobs at a country club because they want their kids to rub elbows with wealthy, well-educated, well-connected people in their town. 2. Since John Quincy Adams and George W. Bush were both sons of presidents, they grew up rubbing shoulders with important people--that surely helped them both presidents themselves. Origin: The Welcome Mat represents a warm welcome, and to wear out something means to use it too long, so that it is no longer good. 1. Looking at his watch, Uncle Fred said, "It's 9:00 already; we don't want to wear out the welcome mat, so we'd better be going. Thanks for dinner!" 2. The famous Benjamin Franklin warned against wearing out the welcome mat with his saying, "Guests, like fish, begin to smell after three days." Visit often to learn new idioms as I add them. Do you want to learn more about the English language and life in the USA? Contact me now to find out how you can join one of our classes or come study in the US!